Vegetables such as spinach add nutrional value to pizza. Dominos Pizza is a restaurant franchise offering delivery at most locations. While pizza is the main offering, a variety of entrees, appetizers and desserts are available. Pizza is often a high-calorie food, but portion control and healthy choices can lower the calorie count. 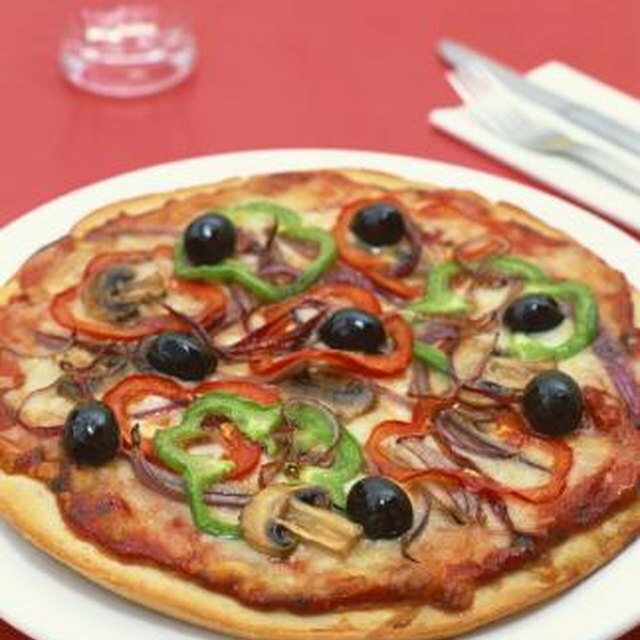 Adding vegetables, mushrooms and spices can boost the nutritional value of pizza. Eating pizza is a popular American pastime. According to the website AmericanHeritage.com, Americans consume around 23 pounds of pizza each year and a whopping 93 percent of them have a slice at least once a month. Dominos Pizza is a prominent supplier, with more than 9,000 stores in operation worldwide, per the corporation's website. The calories in a slice of Dominos Pizza vary widely depending on the crust and toppings chosen. According to the corporation's website, a slice comprising 1/8 of a large, hand-tossed pepperoni pizza contains 296 calories. A comparable slice of thin crust cheese pizza contains 226 calories while a comparable slice of deep dish Italian sausage pizza delivers 354 calories. Calories for a large slice of the various Feast pizzas range from 230 to 471 calories per slice. Dominos Pizza's pizzas have crusts containing flour, yeast, sugar, salt, soybean oil and other ingredients. The pizza sauce is made from tomato puree along with sugar, salt, soybean oil and other ingredients. The cheese is part-skim mozzarella cheese. Protein topping offerings include ham, pepperoni, Italian sausage, anchovies, Philly steak, beef, chorizo and grilled chicken. Vegetable topping offerings include green chile peppers, onions, banana peppers, tomatoes, roasted red peppers, green bell peppers, jalapeno peppers, green olives, black olives and spinach. Pineapple, mushrooms and a variety of spices are also available. Dominos Pizza entree items include bread bowl pasta and sandwiches. The bread bowl pastas ordered from the menu contain 1,340 to 1,480 calories apiece and are intended to be two servings. The sandwiches range in calories from 680 to 900 calories apiece. Side items include salads, which range from 140 to 170 calories without toppings; chicken wings, which range from 204 to 220 calories per serving; cheese bread which weighs in at 116 calories per slice; and chocolate cakes, which contain 345 calories per cake. To make a healthier selection, eat a salad with no dressing or a low-calorie dressing and a slice of thin crust pizza with vegetable toppings. The U.S. Department of Agriculture's website MyPyramid.gov recommends asking for extra vegetables on the pizza. Avoid the calorie-laden bread bowl pastas, chicken wings and sandwiches. Have a small portion -- or avoid -- the bread-based appetizers and desserts. Drink water or unsweetened tea. Can You Prepare Fruit Pizza Ahead?